Sovereign defaults always come with a significant cost to the indebted country. Puerto Rico was no exception. On July 1, 2016, the U.S. territory, which has been mired in a years-long debt crisis, failed to make good on $2 billion of bond payments due, triggering the worst default in its history. Puerto Rico’s governor Alejandro García Padilla has defended the decision to skip the full payment, emphasizing that the government does not have the money to pay the bill. The move exacerbated the territory’s already-tense relationship with Wall Street firms, some of which own a large part of the island’s constitutionally guaranteed debt. The debt crisis has been evolving for almost a decade. 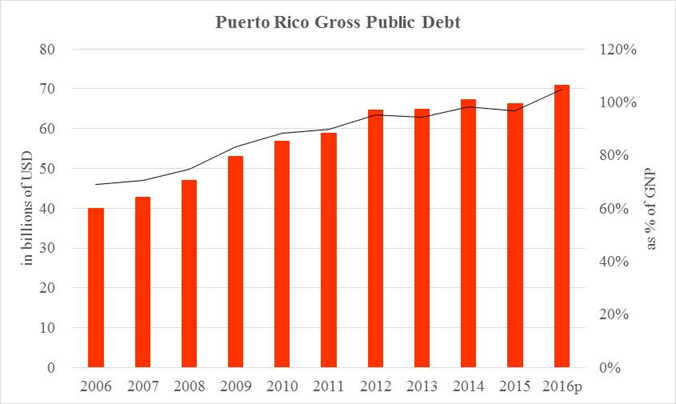 The graph below shows that Puerto Rico’s gross public debt increased from about $40 billion in 2006 to $71 billion in 2016, which amounts to an increase in public-debt-to-GNP ratio from 69.0% to 104.9%. A combination of factors contributed to Puerto Rico’s increasing level of public indebtedness. 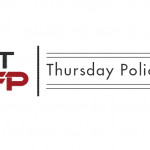 Its economy was heavily reliant on a favorable corporate tax policy, under which the profits of the subsidiaries of U.S. corporations operating on the island could be transferred to their parent corporations without paying federal tax. The complete repeal of the policy in 2006 caused many of those corporations to leave, causing a strong economic blow to the territory. While this served as a major cause for Puerto Rico’s deteriorating economic conditions, the government’s inefficient tax revenue collection and federal social funding processes aggravated its budget deficits. Meanwhile, a separate tax policy that Puerto Rico enjoys, triple tax exemption, gave the government a seemingly affordable remedy to relieve its fiscal crisis by continuously issuing new bonds – the policy states that interest income paid to the bondholders is exempt from federal, state, and local taxes, making the island’s debt instruments uniquely attractive to investors. Coupled with the absence of efficient fiscal management and planning practices, the island’s budget gaps and outstanding debt have been growing continually, leading to an almost inevitable default. In order to deal with the ongoing default problem, on June 30, 2016, President Obama signed legislation aimed at addressing some of the challenges facing the territory. A key feature of the Puerto Rico Oversight, Management and Economic Stability Act (PROMESA or “promise”) is the establishment of a Financial Oversight and Management Board (FOMB), a federal oversight board charged with monitoring and regulating Puerto Rico’s fiscal policy decisions. With a stated purpose of providing a method for Puerto Rico to achieve fiscal responsibility and access to the capital markets, the control board will be responsible for approving and ensuring compliant execution of Puerto Rico’s fiscal plans and budgets, as well as oversight of its major financial activities. Explicit financial relief is not provided in the new law but it is anticipated that the FOMB will use its statutory authorities to influence a restructuring of Puerto Rico’s existing debt load. Response to the legislative decision to establish the control board is mixed. On the one hand, supporters of the legislation emphasize the role of the FOMB in helping Puerto Rico restructure its massive debt, given the island’s inability to declare bankruptcy under U.S. law. The board is expected to protect the territory by initiating voluntary negotiations with creditors, thus, having a final say on restructuring plans. The legislation will be, according to President Obama, “a critical step toward economic recovery” for millions of Puerto Ricans. On the other hand, critics point out several shortcomings of this intervention. Concerns center on the board’s significant authority over Puerto Rico’s government. Under the oversight board, Puerto Rico’s elected officials may lose fiscal policy-making power as such decisions will be subject to FOMB control. Furthermore, although the new law protects the island from immediate creditor lawsuits until at least February of next year, investors in Puerto Rican debt are still legally jockeying for repayment. Notwithstanding PROMESA, long-term fiscal prospects for Puerto Rico remain dim. In addition to the obvious negative fiscal implications of Puerto Rico’s massive debt loads, the severe reputational damage resulting from default will make it challenging for that government to rebuild investor trust and regain access to debt markets at affordable terms in the future. That will certainly add to already negative investor sentiment and further avert direct investment from outside the territory. Together with falling consumer incomes and spending, as well as declining exports due to falling production, economic challenges are likely to persist, possibly for years. Given the severe economic and social challenges facing Puerto Rico – and with some residents likening the loss of fiscal independence to colonialism – it now remains to be seen how well the FOMB handles the task of fulfilling the “promise” for the troubled island.